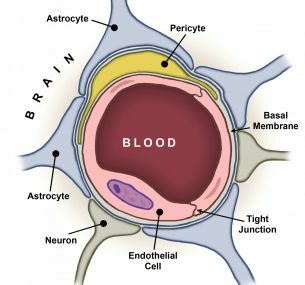 The blood-brain barrier (BBB) separates the blood circulating through our bodies from the central nervous system (CNS), which includes the brain. This acts as a control, ensuring that substances that are needed for healthy brain function, such as glucose, amino acids and electrolytes, are present in appropriate levels. It also protects our brain from harmful substances in the blood, such as disease-causing bacteria and toxins. So how does it do this? Like blood vessels in the rest of the body, those in the CNS are lined with a thin layer of so-called endothelial cells, which are in direct contact with the blood inside the vessels. But CNS blood vessels differ in that their endothelial cells are packed tightly side by side, with their membranes zipped together by specialised protein structures that form tight junctions. These restrict the flow of substances from the blood to the CNS, allowing only small molecules such as water, some gases, and compounds that can pass unaided through cell membranes (called lipid-soluble molecules) to pass freely into the brain. The membranes also contain efflux pumps, which kick potentially harmful compounds and drugs back out of the brain. Other channels, transporters and receptors in the membranes help essential nutrients and molecules get into the brain. CNS blood vessels are also surrounded by a lot more supporting cells (pericytes) than blood vessels found elsewhere in the body. In addition they are surrounded by neural cells called astrocytes. The pericytes and astrocytes provide an extra barrier and influence the expression of genes that play a role in the selectivity of the BBB. You can see that the BBB is not just a simple barrier, but rather a sophisticated and carefully managed border control mechanism. What’s this got to do with brain tumours? The blood-brain barrier (BBB) protects our brains from harm. But its success is also its undoing when it comes to treating neurological diseases, including brain tumours. The strict border control of the BBB restricts entry into the brain of many small-molecule drugs and nearly all large molecule drugs that have been developed to treat brain disorders. In brain tumours alone, this is a huge problem. Worldwide, around 256,000 brain and CNS tumours are diagnosed per year – that’s 700 every day. And incidence is rising, mainly due to an ageing population coupled with a lack of progress in treatment. In the UK, since the early 1990s, incidence rates have increased by around a third (34%). Add to this the fact that 30-40% of all cancers metastasise to the brain, and that bypassing the BBB is key to the effective treatment of many other neurological diseases (including Parkinson’s Disease, stroke, Alzheimer’s Disease and epilepsy), you realise that the implications of the BBB challenge are staggering. It is estimated that more than 20 million patients worldwide currently suffer from CNS-related disorders that would benefit from better transport of drugs across the BBB! (2) initiate and strengthen research collaborations to accelerate the development and translation of drug delivery systems that target brain diseases. Thankfully, more and more researchers and clinicians are now trying to address the blood-brain barrier (BBB) challenge, and a range of drug delivery systems and drug delivery routes are being explored. Procedures that bypass the BBB by local injection of drug into brain tissue (interstitial) or into cerebral-spinal fluid (intraCSF) using catheters have been in use since the 1990s. A more recent development involves the surgical insertion of a catheter into the brain, coupled with drug delivery under a constant pressure gradient (convection enhanced delivery). Other delivery routes include intravenous, intra-arterial and intranasal methods, as well as the placement of drug-containing polymers at the tumour site during surgery. A whole other area of investigation is focused on ways to temporarily disrupt the BBB whilst drugs are delivered into the brain. Methods under investigation to create this disruption include the use of ultrasound, heating (hyperthermia), osmotic pressure, electromagnetic radiation and biochemical agents such as cyclodextrin. On a parallel with these ‘routes’ to delivery, numerous drug delivery systems are also being investigated for their potential to ferry therapeutic cargo across the BBB. These include antibodies, viruses, nanoparticles, liposomes and polymeric micelles. Some of these cross the BBB unaided; others work via the ‘Trojan horse’ approach. This involves modifying the delivery system or ‘vector’ so that it can attach to a transporter in the brain endothelial cell membrane. This transporter then carries the vector, and its therapeutic cargo, across the BBB and into the brain. Nanoparticles, for example, have been decorated with glutathione, enabling their BBB passage via the glutathione transporter. Our own immune cells can cross the BBB unaided, and researchers are keen to explore their potential as drug delivery systems. We have already seen promising research showing that immune cells can be used to deliver drugs into the brain, whether the drug is inside the immune cell (e.g. immune cells harbouring drug-containing liposomes) or attached to it (e.g. antibodies used to link drug-containing polymers to immune cells). 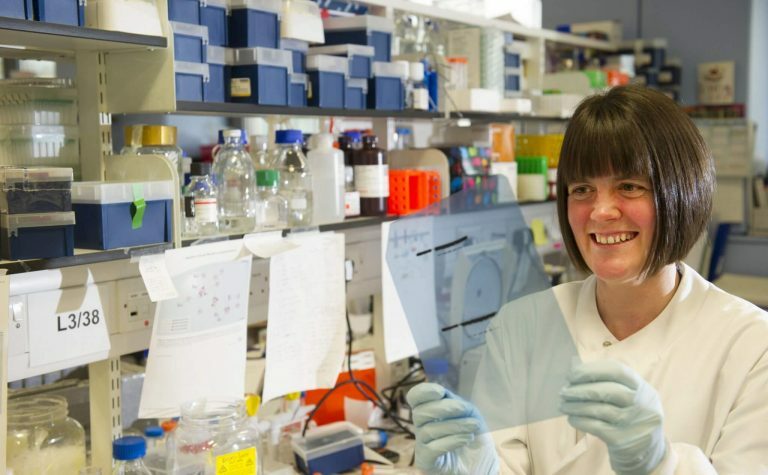 The power of our immune system has also been harnessed indirectly, with promising results from a small clinical trial in the UK recently hitting the headlines. A naturally occurring virus that can cause mild flu-like symptoms – reovirus – was injected into the patients’ bloodstream. 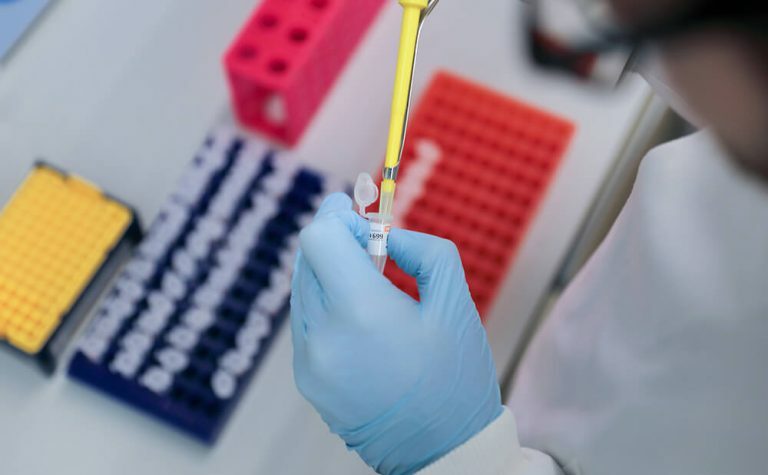 The virus managed to cross the BBB and infect the brain tumour cells, which in turn triggered the patients’ own immune systems to mount an attack on the reovirus-containing tumour. Posted with permission, © Johns Hopkins University Neurosurgery – Ian Suk. All rights reserved. 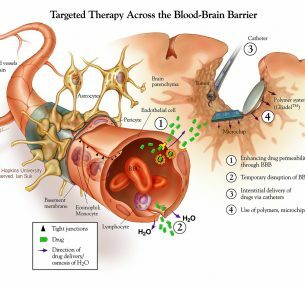 Getting treatments across the blood-brain barrier in effective concentrations for a sufficient time period is a formidable challenge that haunts many neurological diseases. But, with an increasing number of tools to choose from, researchers and clinicians are now confident that we are moving in the right direction. For so long, the research emphasis has been on developing new treatments. We are now entering an era of raised awareness of the drug delivery challenge. The gap between the surge in new drug development and advances in drug delivery to the brain is starting to close. 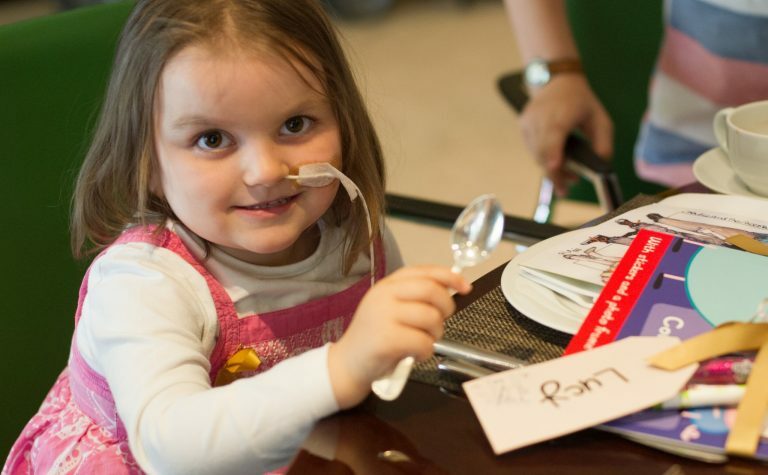 Initiatives such as the Children’s Brain Tumour Drug Delivery Consortium (CBTDDC) are designed to help address this imbalance, accelerating the translation of advances in drug delivery research into real benefits for patients. Help us to help you by engaging with our consortium.